One of the most distinctive—and comical-looking—megafauna mammals of prehistoric times, Glyptodon was essentially a dinosaur-sized armadillo, with a huge, round, armored carapace, stubby, turtle-like legs, and a blunt head on a short neck. As many commentators have pointed out, this Pleistocene mammal looked a bit like a Volkswagen Beetle, and tucked up under its shell it would have been virtually immune to predation (unless an enterprising meat-eater figured out a way to flip Glyptodon onto its back and dig into its soft belly). 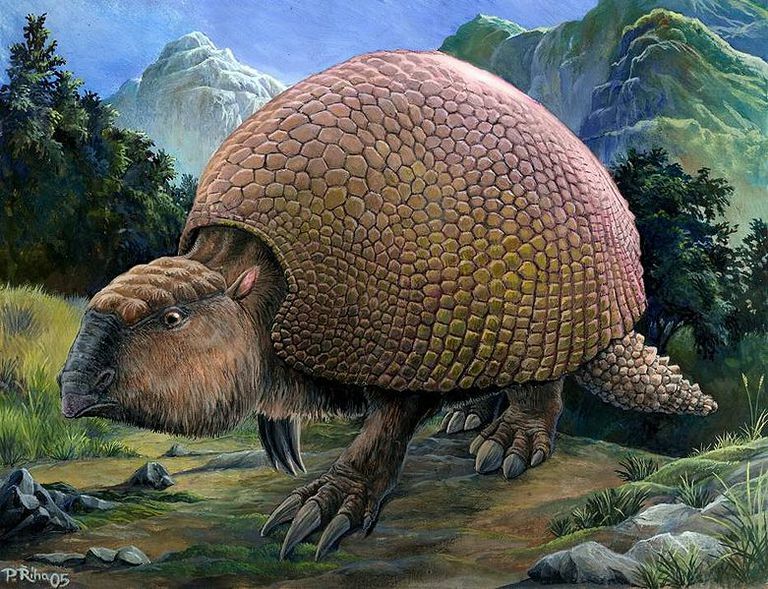 The only thing Glyptodon lacked was a clubbed or spiked tail, a feature evolved by its close relative Doedicurus (not to mention the dinosaurs that most resembled it, and which lived tens of millions of years earlier, Ankylosaurus and Stegosaurus). Discovered in the early 19th century, the type fossil of Glyptodon was initially mistaken for a specimen of Megatherium, aka the Giant Sloth, until one enterprising naturalist (braving howls of laughter, no doubt) thought to compare the bones with those of a modern armadillo. Once that simple, if bizarre, kinship was established, Glyptodon went by a bewildering variety of vaguely comical names — including Hoplophorus, Pachypus, Schistopleuron, and Chlamydotherium — until the English authority Richard Owen finally bestowed the name that stuck, Greek for "carved tooth." The South American Glyptodon survived well into early historical times, only going extinct about 10,000 years ago, shortly after the last Ice Age, along with most its fellow megafauna mammals from around the world (such as Diprotodon, the Giant Wombat, from Australia, and Castoroides, the Giant Beaver, from North America). This huge, slow-moving armadillo was probably hunted to extinction by early humans, who would have prized it not only for its meat but also for its roomy carapace — there's evidence that the earliest settlers of South America sheltered from the snow and rain under Glyptodon shells!